Concrete dye is quickly becoming a leader in concrete products. Concrete dyes can be used to simply change the color of concrete from grey to a designer shade, or it can be used to create a work of art. Dying concrete is a good do-it-yourself project. Because most concrete dyes are water soluble, they are safe to use, easy to clean up and quick to dry. For most home projects, you can expect to complete the dye job in a weekend. Dyeing floors is different from staining them. With dye, there is no chemical reaction with the concrete, it simply dyes the surface. Dyes can come in liquid form or as dry pigment, the latter to be mixed with a solvent (usually acetone). The color of the finished product and the depth that the dye penetrates into the concrete depends on the dye-to-solvent ratio. 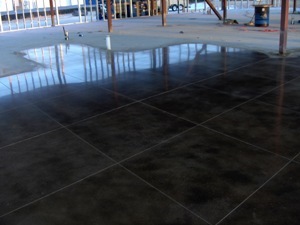 We specialize in Resinous Flooring, Epoxy Flooring, Vapor Mitigation Systems, Concrete Polishing, Concrete Resurfacing, Concrete Grinding, Shot Blasting, Concrete Staining & Sealing, Flooring Demolition. We are proud to offer our services throughout Florida, Georgia, Alabama, Louisiana and Texas. Call or Contact us today for a free estimate from one of our flooring experts! ©2013 Applied Flooring Technologies, Inc.